Every product that hits the shelves of Trader Joe’s goes through a rigorous review and taste-testing process, and sometimes, the result is pure genius. A perfect example? 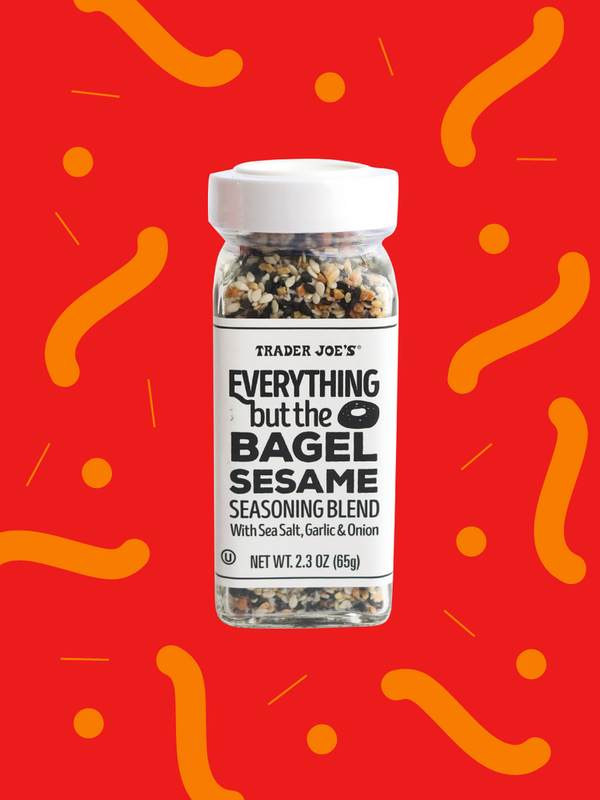 The brand’s Everything But the Bagel Sesame Seasoning Blend, a combination of black and white sesame seeds, poppy seeds, dried onion, dried garlic, and sea salt, in a shaker for $1.99. It’s everything you find coating the outside of an everything bagel, and the flavors are spot-on. Since TJ’s launched the seasoning in February 2017, it has been nearly impossible for the store to keep it on the shelves (hot tip: It’s available on Amazon Prime, but you will pay a premium—a shaker costs $6.79). To say it has a cult-following is an understatement. However, the question of exactly what you should do with this everything-bagel-in-a-bottle remains. TJ’s recommends “grilled chicken, buttered popcorn, baked potatoes, creamy dips, pizza dough, salad dressings, pasta, mac & cheese, or panko-breaded anything.” But we think we can do even better. Here are seven Domino-tested and approved ways to use the blend. Prepare to be blown away by everything bagel deliciousness. A few liberal shakes of Everything But the Bagel makes even the most basic egg on toast taste like egg on an everything bagel—and that’s a welcome upgrade. For an even more delicious meal, make a piece of avocado toast, and top it with a fried egg sprinkled with Everything But the Bagel. If you’re really serious, add bacon. One Domino editor eats this at least four times a week. Tribe actually sells everything bagel hummus, but it’s not that great. It’s basically just kind of garlicky hummus. Make your own hummus, or you can just use your favorite brand, and pour—yes, pour—on the seasoning. More is more here. This also is a great way to take white bean dip or guacamole to the next level. Imagine lox and capers and cream cheese on an everything bagel—except in healthy dinner form. This simple recipe turns a piece of salmon into so much more. Pre-heat your oven to 350 degrees. Chop the dill and capers, and mix with the Greek yogurt. Arrange the salmon in a baking dish (spray with non-stick cooking spray, drizzle with oil, or use parchment paper if you’re worried about sticking), and spread yogurt mixture on top. Liberally shake on Everything But the Bagel Sesame Seasoning Blend. Bake for 12 to 15 minutes or until cooked through. Pretty much all veggies taste amazing with this seasoning, but crispy, slightly charred broccolini is especially delicious. Pre-heat your oven to 400 degrees, and arrange broccolini on a baking sheet with olive oil and plenty of Everything But the Bagel Seasoning. Roast for 10 to 15 minutes. The real reason restaurant burgers are so much better than burgers you make at home? Seasoning. Restaurant chefs load up their burger patties with salt and pepper (and sometimes butter, soy sauce, or other makes-everything-taste-better additions). To cook a stellar burger at home, start with your favorite blend of beef, gently mold it into a burger shape, and liberally coat it with Everything But the Bagel. If you don’t have a grill, sear it on a cast iron skillet for the best crust, and cook it to your desired temperature. Even if you serve it on a basic bun with nothing else, it will taste like a restaurant creation. We recently rounded up the best—and most unique—bloody mary recipes out there, including this everything bagel version from Foxes Love Lemons. While the author makes her own everything bagel seasoning mix, using the TJs version to rim the glass of your favorite bloody mary is both easy and impressive. Roasted chickpeas are one of the easiest, healthiest, and tastiest snacks you can make. Preheat the oven to 400 degrees.Drain and rinse two 15 oz. cans, and pat the chickpeas dry. Spread them in a single layer on a rimmed baking sheet, and coat them with 2 tablespoons olive oil. Roast for 20 to 30 minutes or until they are brown and crisp. Toss the chickpeas with 1 tablespoon of seasoning (or, let’s be real, as much as you want) and enjoy. This story was originally published June 8, 2017. It has been updated with new information.